I use two panniers when commuting to work: an Arkel Bug, which doubles as a backpack and contains work in progress, digital tools, lunch, cap, spare shirt and small towel; and an old Eclipse bag for pump, tools, spare tube, U-lock and cable. 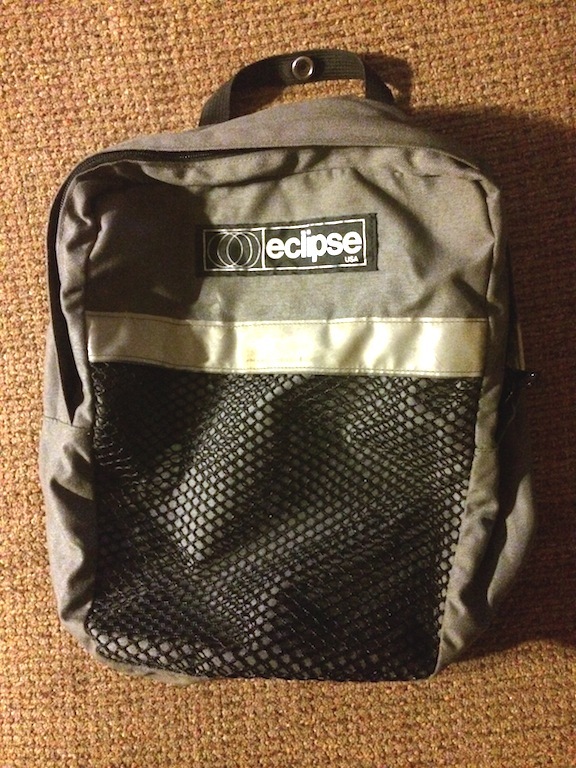 The handle on the Eclipse bag failed at one of two junctions with the bag, leaving me with a strap instead of a handle. Unfortunately, the handle was more than a nicety; I needed an intact handle to install and remove the bag and carry it around with me off the bike. Why did the handle fail? Probably because it was sewn only to the thin nylon material at the top of the bag. A better strategy would have been to extend the handle behind the top hooks and bolt the hooks and the handle to the internal plastic stiffener. Here’s what the back of the Eclipse bag looks like from the factory: two steel hooks at the top and a spring-and-hook assembly at the bottom. With the exception of the handle, it’s a robust design. The stiffener was also broken, though that failure didn’t affect functionality. I set the bag aside, and switched to its mate, which was in much better condition. However, I knew the handle was still the weak spot. 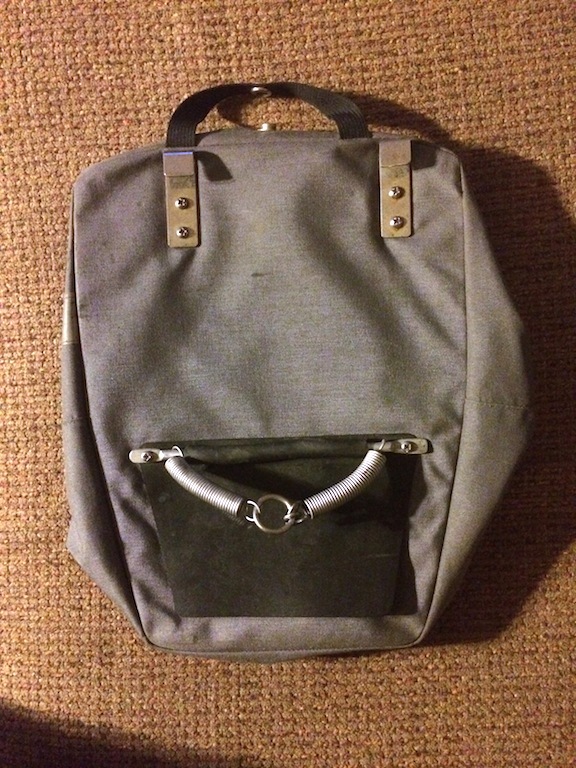 I had a few options: I could 1) use the replacement until its handle failed, 2) remove the original handle in favor of a rear-mount handle of my own design, or 3) update the bag’s entire mounting system. I’m a big fan of how easy it is to install and remove the Arkel Bug, so I chose Alternative 3 and bought an 8-inch Arkel cam-lock hook kit (it also comes in a 10-inch version for larger bags). Cost: $24.99, plus shipping. Here are the tools I used to update the Eclipse. 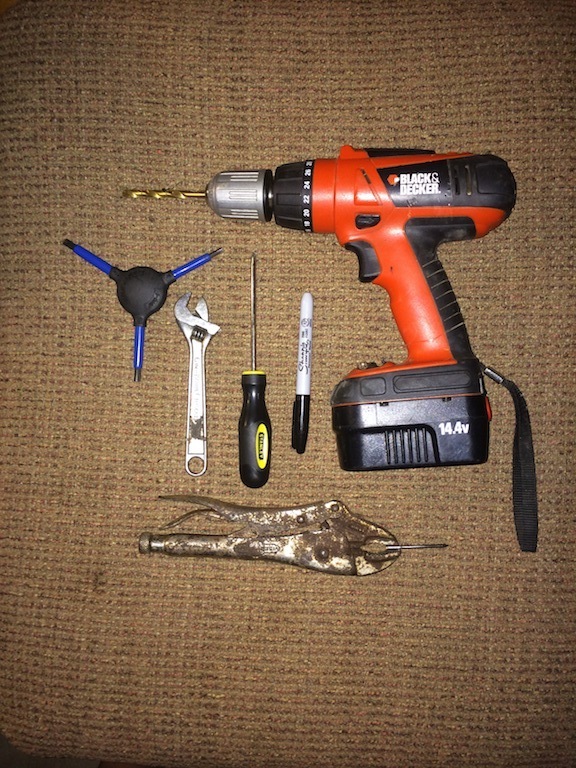 Note the locking pliers, which are holding a nail. I used this because I didn’t have an awl. 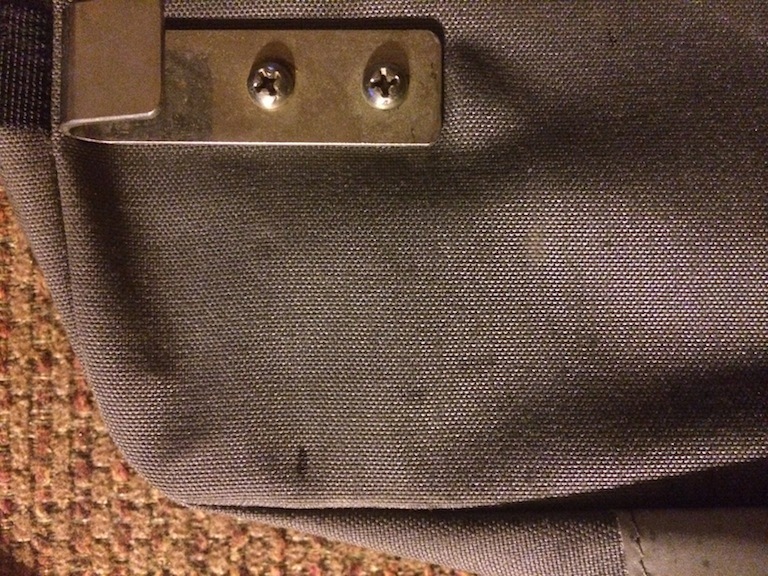 Before I removed the original hardware, I positioned the new hooks over the old hooks and made a mark on both sides of the back of the bag. These marks ensured the new hooks would hang at the same height as the original ones. 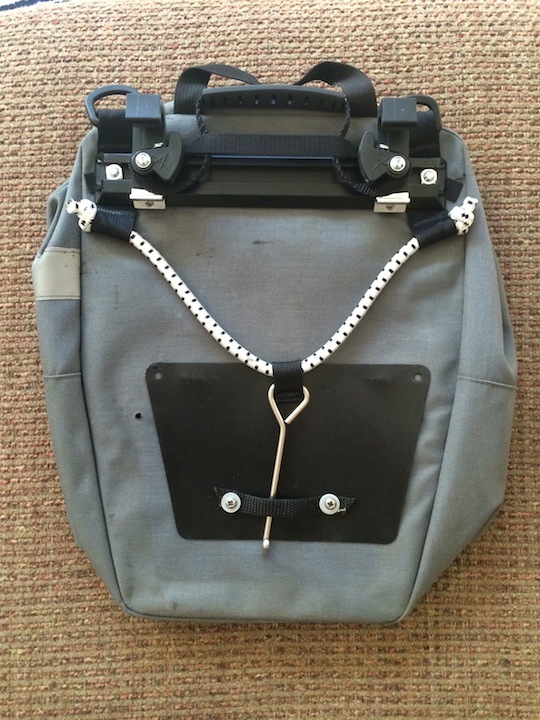 Here’s the bag side of the Arkel system (hooks facing away, toward the rack). It’s normally held together by the two mounting bolts just outside the D-rings in this picture. From top: the upper hook assembly with handle, the handle’s retaining strap, and the bottom hook assembly. The old hardware has been removed. The original Eclipse handle (top) remains; I’m leaving it on for now. You’re looking at the rack side of the upper hook assembly. The hooks are bolted to a crossbar, and just below the hooks are spring-loaded cams. The handle is out of position in this picture–it will end up between the top hooks. Here’s how the system works. 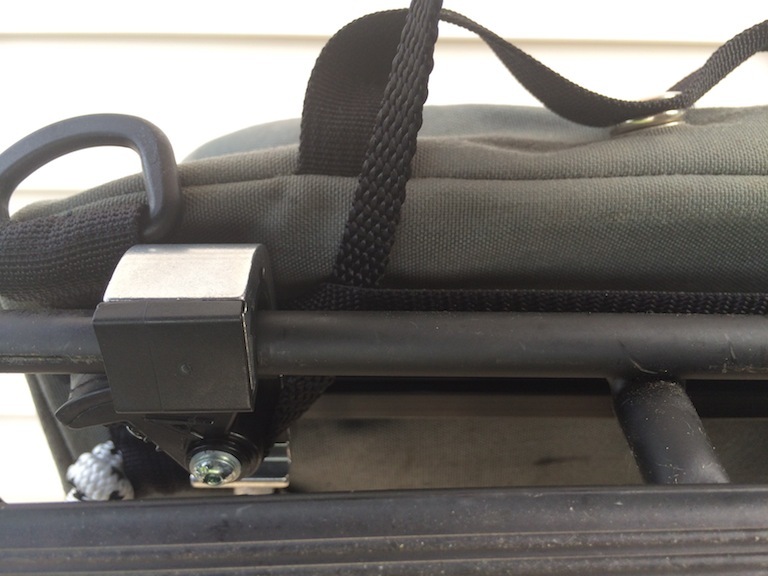 You capture the bottom of the rack on your bicycle with the hook near the bottom of the bag and pull up on the handle. When you pull on the handle, the cams rotate below the top hooks. You set the hooks on the top rail of the rack and release the handle: the cams then rotate in the opposite direction, trapping the top rail. Note that I’ve marked the position of the crossbar mounting holes. Here, I’ve peeled back the shell of the bag to reveal one end of the plastic stiffener. I made the hole on the far left for one end of the Arkel mount. The other four holes are original. Eclipse used the same stiffener for the left and right bags and mounted its hooks in one set of holes or the other to ensure the correct set-back on the rack. 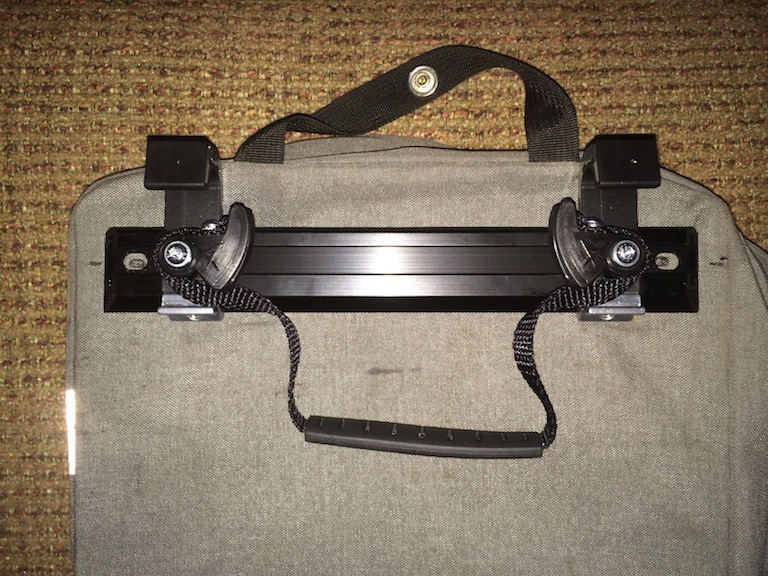 Need to shift a bag with an Arkel mount forward or backward on the rack? The hooks slide along the aluminum crossbar. All you need is a small Allen wrench. Here’s the completed assembly. 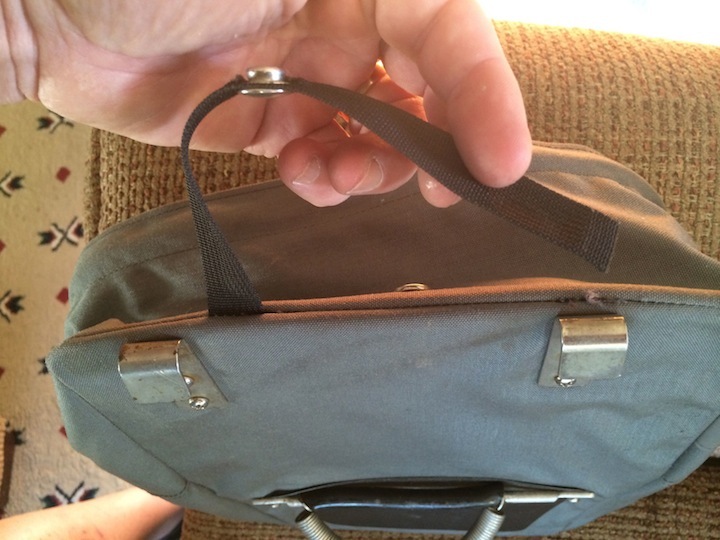 Disregard the two loops of black strap at the top of the bag–those are the original handle, snapped in place against the bag. I heated a nail to melt four new holes through the nylon shell and plastic stiffener: two for the Arkel mount and two for the bottom hook retainer, which I fashioned from an old nylon toe strap (Arkel doesn’t supply a retainer with its aftermarket kits). Heat melts the nylon, which prevents fraying. 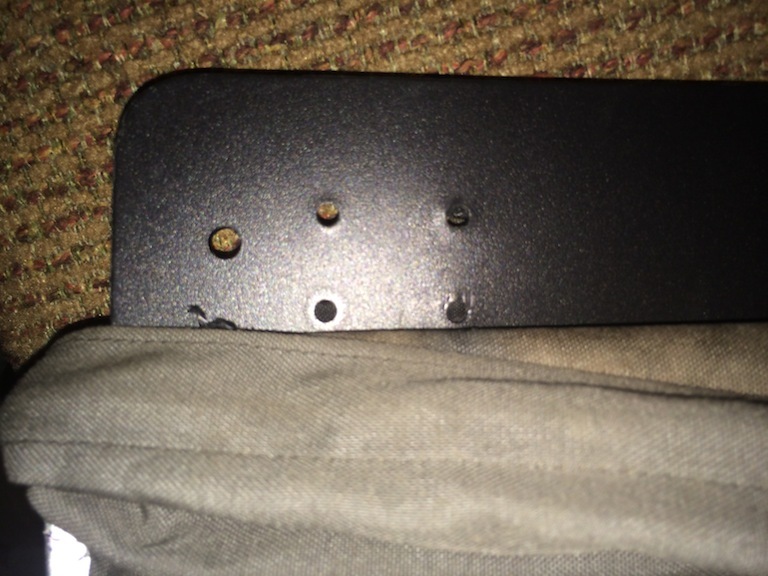 I opened up the holes at the top of the stiffener with a 1/4-inch drill bit. Then I glued the top of the Eclipse black bag protector to the bag’s shell. That thing about measuring twice, cutting once? I’m going to try that sometime. You’ll note an unused hole in the bag just below midpoint that went uncovered when I somehow shifted the protector to the right. Here’s the installation. 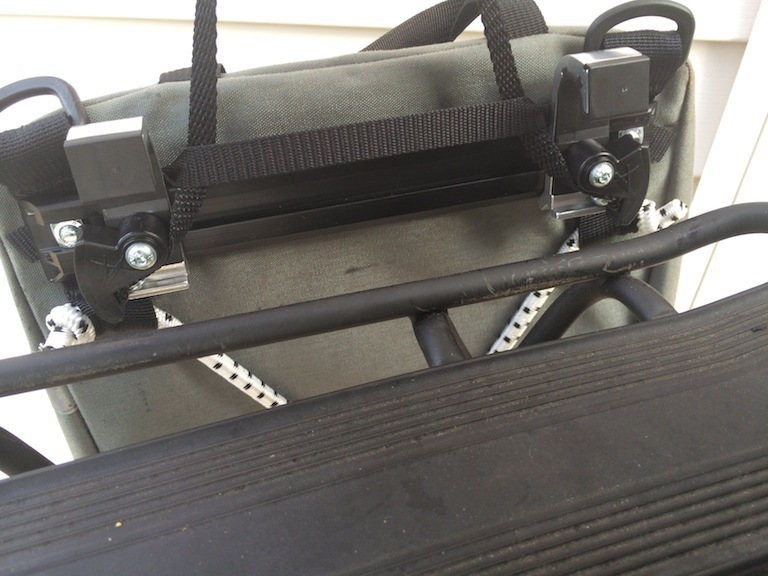 The black and white bungee cord leads to the bottom hook, already in place. I’m pulling up on the handle and the cams are rotated. And…we’re done. The top rail of the rack is trapped between hook and cam. Just like it works in the video. 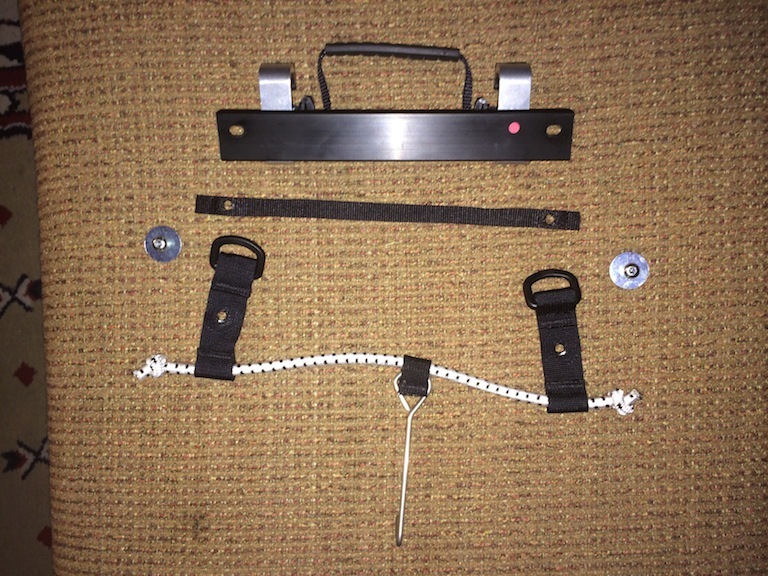 This entry was posted in Equipment and tagged Arkel, cam-lock hook kit, Eclipse, pannier. Bookmark the permalink. The modification is awesome, I love it. This will help me modify my set. On 2/13/2017 a guy came by my work place and sold me the two rear panniers and the front pannier along with a VETTA rack. I do need to modify them to make it work with my BIKE PLANET rack I have on my bike. This is very helpful.